A Co Donegal man who runs a sanctuary for abandoned donkeys has had a huge response to a public appeal for help. Danny Curran, from Falcarragh, runs the sanctuary in Raphoe where he now lives. And after an appeal in a national newspaper last week, he has been inundated with offers of help. He is now seeking the help of a lorry driver. He explained: “A farmer in Laois has offered us a lorry load of silage but we don’t have the transport for it. 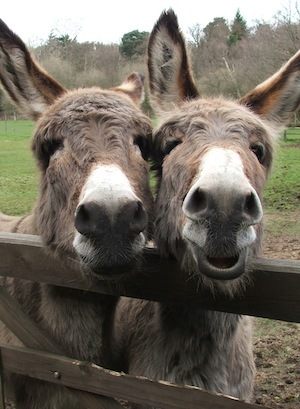 He urgently needs food and support to get the donkeys over the Christmas period. And there is an adopt-a-donkey initiative which local schools have helped with, costing €25 per month. “Some are abandoned because people can’t afford to keep them any longer. I found one tied to a scrapped car. Other people buy them as pets and put them in their gardens only to realise that they ruin your lawn,” said Danny.